* This man owed $134 in property taxes. The District sold the lien to an investor who foreclosed on his $197,000 house and sold it. * Stanford Is Now Basically a Venture-Capital Fund With Some Dorms. * Remaking the University: Rather than accept further gutting and the corporate solutions that are a domestic version of structural adjustment, we should work to meet our actual needs. * Intellectual property and the struggle over value. When you consider the many ages of adolescent girls, it is clear that our cultural imagination encourages boys and men to think of young girls as fair game. By the time a girl is 12, she isn’t even seen as a whole human being, but regarded for her parts. She’s “forbidden fruit,” “a temptress,” “a man trap” and “asking for it.” All she has to do to be targeted sexually is go for a walk. If she wears skimpy clothes, is overly friendly with a teacher, dances with abandon, especially if she’s a girl or young woman of color, she might be blamed for her own assault. This is a male fantasy. * Teaching naked, parts 1 and 2. I had my students fill out mid-semester evaluations last fall. No big deal, just answer these four questions: 1) What am I doing to help you learn? 2) What could I be doing better to help you learn? 3) What are you doing to help yourself learn? and 4) What could you be doing better to help yourself learn? I had them turn the evaluations in anonymously to allow more genuine feedback. * What’s Killing Poor White Women? * NSA Revelations Cast Doubt on the Entire Tech Industry. * Anthology of “21st Century Science Fiction” Coming November 5. Patrick Nielsen Hayden and David Hartwell have edited Twenty-First Century Science Fiction , a 250,000-word anthology of short fiction by writers who came to prominence since the turn of the century. The authors include “Vandana Singh, Charles Stross, Paolo Bacigalupi, Neal Asher, Rachel Swirsky, John Scalzi, M. Rickert, Tony Ballantyne, David Levine, Genevieve Valentine, Ian Creasey, Marissa Lingen, Paul Cornell, Elizabeth Bear, David Moles, Mary Robinette Kowal, Madeleine Ashby, Tobias Buckell, Ken Liu, Oliver Morton, Karl Schroeder, Brenda Cooper, Liz Williams, Ted Kosmatka, Catherynne M. Valente, Daryl Gregory, Alaya Dawn Johnson, James Cambias, Yoon Ha Lee, Hannu Rajaniemi, Kage Baker, Peter Watts, Jo Walton, and Cory Doctorow. * Scientists are losing confidence that climate change will increase the frequency of hurricanes. I’m sure the reporting on this will be balanced and responsible, dedicated to getting to the bottom of what’s really going on. * Does the dog die? Check before you view. * Bloomberg lets the mask slip. Yikes. * Why Big Pharma should be scared of the gaming industry. 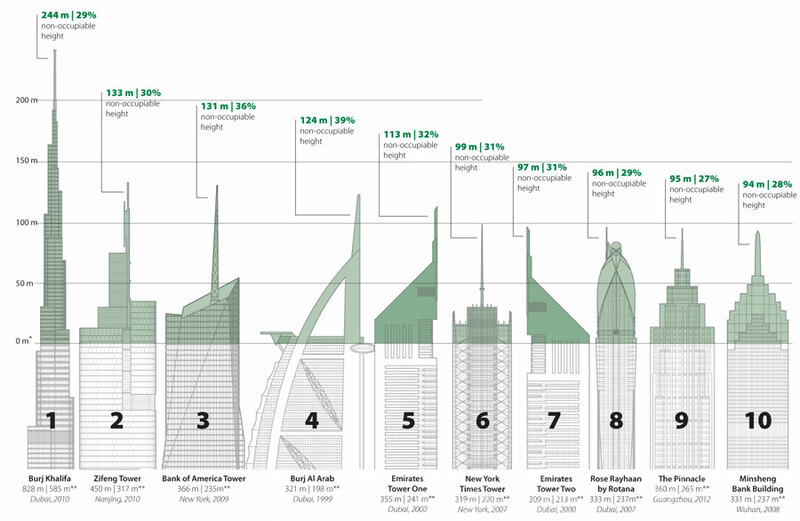 * Much of the height in Earth’s tallest towers is useless space. * Overworked America: 12 Charts That Will Make Your Blood Boil. * What Are Students Tweeting About Us? * Prove me wrong, boy. Prove me wrong. * And Angus Johnston concludes his series on the most important student activism stories to watch in 2013-2014: Part 3, 4. Andy Borowitz is too big to fail. In the New Yorker, alongside John Cassiday’s claim that the Lehman Brothers collapse gave the election to Obama (see also Krugman last night) and a fascinating article on the legal intricacies of trust funds for dogs. Is it right to give so much money to a dog—or to dogs generally? And what is the limit of such dispensations to pets? Will there come a time when dogs can sue for a new guardian—or to avoid being put to sleep? One philosopher draws a distinction between the needs of Trouble and those of dogs as a whole. Helmsley “did a disservice to the people in the dog world and to dogs generally by leaving such an enormous amount of money for her own dog,” Jeff McMahan, who teaches philosophy at Rutgers University, said. “To give even two million dollars to a single little dog is like setting the money on fire in front of a group of poor people. To bestow that amount of money is contemptuous of the poor, and that may be one reason she did it.